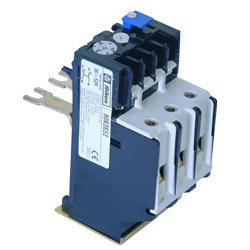 Manufacturer of Circuit Breakers Supply. 1. Overload and phase failure relay. 2. Contact arrangement: 1NO and 1NC. 3. Reset: hand – auto - stop. Tripping current arranges: 1. 29 ~ 42 A. 2. 36 ~ 52 A. 3. 45 ~ 63 A. 4. 60 ~ 80 A.